Nate Jaqua is the Amigo Energy Man of the Match, as well as the World Soccer Wrap Man of the Match. 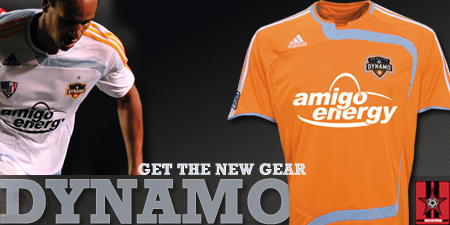 That's the match, Dynamo win 3 - 0 over KC, not the KC team we saw in the playoffs last year, that's for sure. 89th Min. - Over 14,000 in attendance today and many are headed to the A/C in their cars. 87th Min. - GOAL! this one for KC, by Davy Arnaud. No assist. 85th Min. - Three straight corners for Dynamo, but no result on those set pieces. KC finally cleared it. 83rd Min. - Jaqua out and Cameron in for Houston. Good game for Jaqua, great to have him back. Kai just had a nice run, but no goal. 70th Min - Ashe in and Davis out for Dynamo. Wolff out and Gomez in for Kansas City. 68th Min, - GOAL!!!!!!!!!!!!!!!!!!!! Nate Jaqua gets his second goal of the match, Waibel gets the assist - it's now Dynamo 3 - 0 Wizards. 59th Min. - Yellow card to KC's Carlos Marinelli. 54th Min. - GOAL!!!!!!!!!!!!!!!! Nate Jaqua, with assists to Holden and Kamara. Second half is underway in Houston. Went down to see the Texian Army, give them credit, it's hot out there folks. That's Half-Time. Dynamo 1 - 0 Wizards. That was Kai's first assist in the MLS. Tony Caig in goal. Onstad, DeRo, Clark, and Ching all off on national call-ups. US barely beat Cuba last night. About 90 degrees here today, sunny. But, thankfully, the humidity is low. 28th Min - GOAL!!!!!!!!!!!!!!!! Brad Davis, assist to Kai Kamara. Great unselfish play for Kamara gettin the ball back to Davis. Real Salt Lake had a draw with L.A. Galaxy last night. A couple good saves by Tony Caig and some good offensive chances for the Dynamo so far. Kai Kamara starting up front with Nate Jaqua. It's the 23rd min., took some time to get the computer booted up, but nothing has happened so far. Still Nil - Nil.